Are you curious about sweat lodge ceremonies? You’re not alone. For many, sweat lodge ceremonies seem enticing and mysterious—and maybe a little bit scary. With all the bad press these ceremonies received a few years ago, you might even be wondering if sweat lodge ceremonies are safe. The truth is, humans have been taking part in ritual sweats for thousands of years. But as with any activity that involves extremes, like extreme heat, sweat lodge ceremonies are not without risks. What Happens During a Sweat Lodge Ceremony? Sweat lodge ceremonies are about more than just sweating — they’re purification rituals used for a broad range of purposes, depending on the culture and the occasion. Most sweat lodge ceremonies practiced today are associated with Native American cultures, who use these ceremonies to give thanks, to heal, to seek wisdom, and to purify the mind, body, and soul. Native American sweat ceremonies typically take place in domed, circular lodges, though some cultures use teepees, or even pits covered with branches or tree trunks. A fire is lit directly outside the lodge, tended by a highly trained firekeeper who heats the stones that are used to keep the lodge hot. The firekeeper places the stones in a hole in the center of the lodge, often adding tobacco, cedar, or sweetgrass as an offering. The firekeeper also offers prayers while pouring water over the rocks to create thick steam. Every ceremony is different, depending on the traditions of the ceremony’s leader, but they can be held in silence, or accompanied by ritual drumming or chanting. It goes without saying that sweat lodges get hot—really hot. Most lodges stay at over 100 degrees (F) throughout the ceremony. Sweat lodges are different from your sauna at the gym in two important ways. First, saunas are all about the heat, while sweat lodges are intensely spiritually focused. Second, while it’s not recommended to stay in a sauna for longer than 20-30 minutes, most sweat lodge ceremonies last several hours. Every aspect of a sweat lodge ceremony, from the construction of the lodge itself to the prayers offered, is imbued with deeply spiritual symbolism. The shape of the lodge is intended to represent the womb of the Earth, which renews and purifies those within it. The ceremony itself is often divided into four parts representing different spiritual challenges. 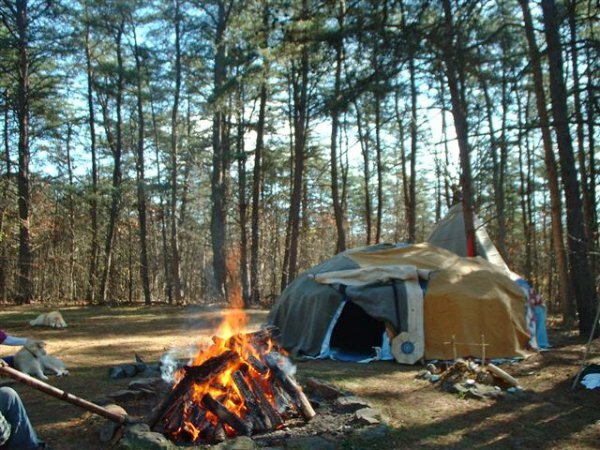 The sweat lodge is a special place that engenders introspection and communion with the Earth, as well as a renewal of social and cultural bonds. Chanting, drumming, and meditation empowers participants to endure the heat for much longer than they usually could, teaching participants to overcome physical discomfort and frustration. These ceremonies can be a profound spiritual experience, and the science of sweat lodges helps explain why. Research has shown that sustained heat releases the same endorphins as heavy physical activity, but without the burst of adrenaline that accompanies a challenging Ashtanga Vinyasa session, for example. Sweat lodges can also help fight infections by creating a temporary fever state in the body, which some say lessens chronic inflammation. The heat is also a great remedy for arthritis, muscle pain, and skin disorders, which can be improved by the increased blood flow at the surface of the skin. Sweat lodges can offer many benefits, but since they take place in such extreme heat, they’re not for everyone. Anyone with underlying health issues, especially illnesses affecting blood pressure or the respiratory system, should talk to a doctor before going on a sweat. Even if you’re in perfect health, dehydration and heat exhaustion can be a real danger if not promptly recognized and treated. If you start to feel dizzy, weak, or faint, it’s 100% acceptable to ask for help and leave the lodge for a break. The leaders—who train for 4 to 8 years before they can conduct a ceremony on their own—are there to help you in case this happens. The biggest danger, however, is a careless sweat lodge leader who lacks proper training and cultural understanding. In 2009, self-help guru James Arthur Ray held a knock-off sweat lodge ceremony in an overcrowded lodge made of plastic and other non-breathable materials. Ray charged $10,000 per person to take part in a dangerous “ceremony” that bore little resemblance to the real thing, and his carelessness and lack of respect for this ancient tradition injured 18 people and killed 3 others. Luckily, such tragedies are rare, and it’s easy enough to safeguard against this danger. Remember that a trained sweat lodge leader will never charge money to take part in this sacred experience. Above all else, listen to what your body is telling you. It’s up to you to protect your health, no matter how much you trust your guide. Is a Sweat Lodge Ceremony For You? Despite the risks, a sweat lodge ceremony can be a life-altering experience, especially for people who are struggling to overcome difficulties such as addictive behaviors. If you’re considering taking part in a sweat, make sure to do your research first—and this includes research about the specific culture whose traditions you’ll be taking part in. Native American communities are rightfully angry about cultural appropriation by people like James Arthur Ray who just don’t care enough to really learn about the people and their traditions. So remember to be grateful for the opportunity to take part in this profound ritual, and do your best to be a good houseguest. Besides, the more you understand, the more you’ll take with you once your spiritual journey in the sweat lodge is over!